I’ve been meaning to write this for a while as I feel it is important to show my gratitude to the great people that run our wonderful liquor stores in Eastern Iowa. We have quite a few to choose from actually. Whether you choose something local, a Hy-Vee, Johncy’s Liquor, Johns Grocery, Family Beer and Liquor, or Benz, we have a pretty great selection of places we can go to get the latest and greatest craft beer. I was a frequent flyer at the Oakland Road Hy-Vee, who, in my opinion has a huge selection of beer to choose from and you can also get added to the beer club. I believe it is buy so many different beers and get a gift card of sorts, which is a pretty sweet deal, I believe the gift card is somewhere between $50-$100. As far as customer service goes, Johncy’s Liquor store in North Liberty seems to take the cake for me. So polite, helpful, and accommodating, Johncy is running a class establishment. Willing to have conversations, help you out with a selection, or anything else, I drive the few extra miles from Mount Vernon because I know I’m going to walk out of Johncy’s with what I wanted. (And probably $50-$100 worth of beer). Another one I have to mention because I practically lived there for a while is the famous John’s Grocery. Terrific selection, especially on the imports, they sell single bottles so you don’t have to throw $10 on something you’re unsure of. I always called them on Wednesday’s just to chat beer with their beerman at the time, Joe Hotek, who is now working for Tallgrass. Joe knew EVERYTHING and ANYTHING about beer and to make it better is just a super nice guy. I go there yet, since my wife is now working in the Iowa City area, and this is another place that it’s hard to leave without dropping a Benjamin. The other place is one that is closer to where my parents and other family members live. Family Beer and Liquor in East Dubuque, IL has a huge selection of beer and has stuff we just can’t get our hands on in Iowa. I reached out to them during the Bourbon County release and they were gracious enough to hold a nice allotment for me. If you call or contact them they will do whatever they can to help, great beer people! You can also buy singles there and you are guaranteed to drop some dough, as they have a great selection. If you’re lucky enough to find limited releases from Firestone Walker, Lost Abbey, and Dogfish, amongst a ton of others. The amount of phone calls they receive when a new brew or a beer that is released occasionally come out has to drive them nuts, but they all handled out well, and they can also blame Toppling Goliath for that. (#beerjoke). So, thanks to all of these terrific beer shops for keeping this beer consumer happy, entertained, and satisfied. Cheers! I agree with all of the beerlove going on here. I frequent Johncy’s because I work 2 blocks away. I like to stop over lunch hour, and all that work there are incredibly generous and all around just pleasant to interact with. Not bad being able to grab all of TG brews over my lunch whenever they seem to show up! Good article baron. 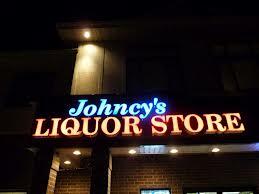 The folks at John’s Grocery and Family Beer and liquor are always great…knowledgeable and friendly staff. Allow me to throw in Gasser True Value in Hazel Green, WI. While they’re more of a hardware/grocery store, they always keep a full line of New Glarus brews in stock. Excellent. Thanks for the recommendation, will stop there to get my NG fix next time in the area. Probably the best staff I have ever encountered in a liquor store. Not sure where they find these people (or how hard they are trained) but always super helpful and pleasant. I love walking through the door at Johncy’s.